Recently I was reviewing my 30x30 list and my oldest son got really interested in it. We talked about what a bucket list was, and after our discussion he decided he wanted to make a list of his own. 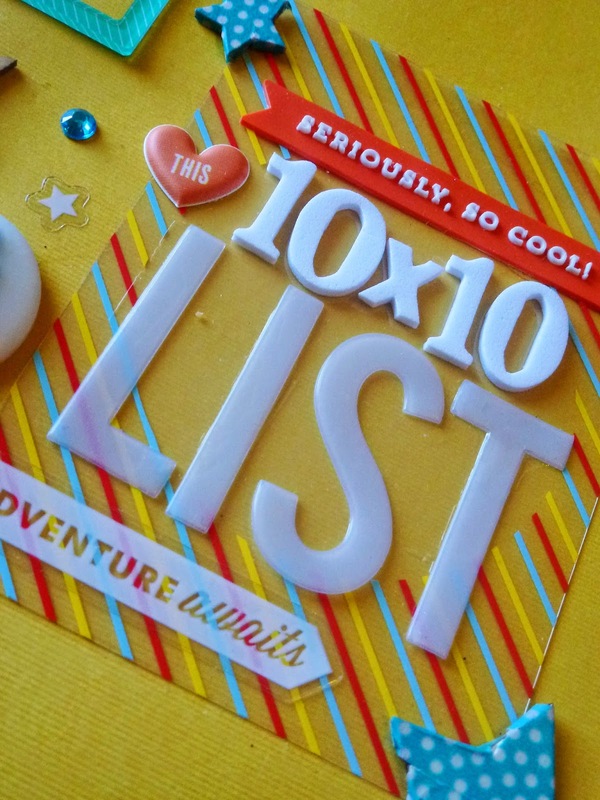 We decided on a 10x10 list, and he wrote down 10 things he wants to do before he turns ten. Some of them are surprising, some of them are so him, and others are going to take a lot of work to accomplish, but this is a great way for he and I to embark on a project together. The Album cover, tried to use his favorite colors, yellow, orange, and Turquoise. This cover was made using this sketch challenge for the Paper Bakery. They have the cutest scrapbook and project kits, so make sure you go check them out. I haven't subscribed yet, but they sure are tempting! Most of the embellishments are from Freckled Fawn's Oh Deer Me monthly kits. I was lucky enough to go to their booth at Scrapbook USA a couple of weeks ago and instantly fell in love with their gorgeous embellishments! So much so that I decided to subscribe! I can't wait for my first monthly kit to arrive! 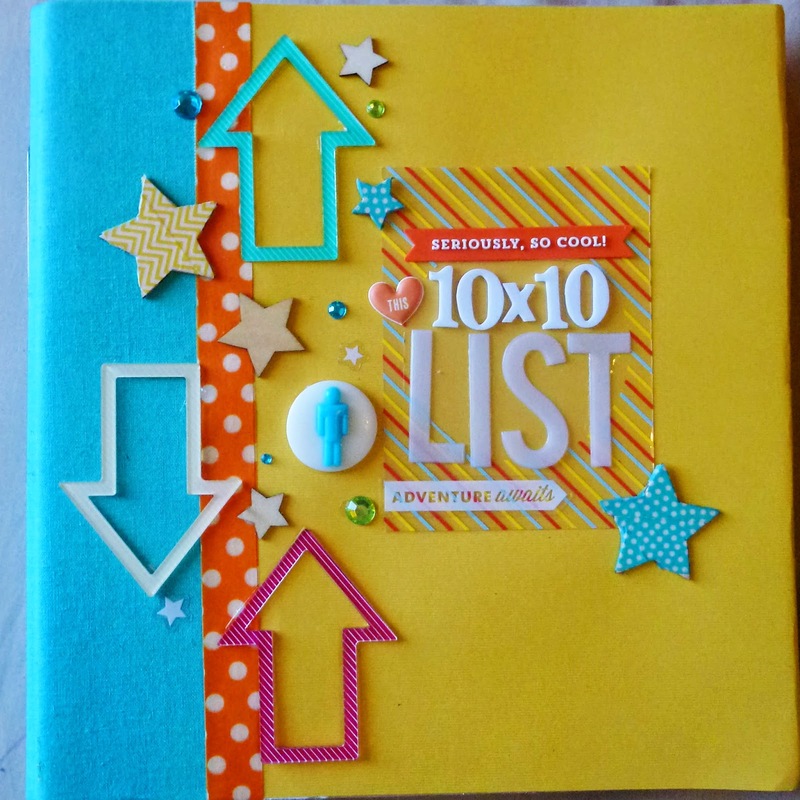 The acrylic arrows are from their December kit, the little resin cameo and the striped overlay card is from the February kit, and the "seriously, so cool!" banner is from the March kit. SO MANY CUTE THINGS. If you fall in love like I did make sure you use me as a reference when signing up and we will both get $5 to use in their store! The wooden stars and the orange polka dot washi are from Micheal's recollection brand, and the cute little bling dots are from the Walmart scrapbooking section. The white foam letter stickers are American Crafts brand thickers. The frosted "list" letters are from Heidi swapp. The little white star stickers and the "adventure awaits" sticker are from Me and My Big Ideas. I plan on doing another blog post to show you the insides of this fun little album. So make sure you check back to take a look! That is so cute! I'd love to know what's on his list. That's coming soon! I've got to finish up something on the inside first. You will love his list! It's very "Ryan"
Holly what a brilliant idea to do this for your son and I love that you used our sketch to decorate the cover!! It looks fabulous! Thanks for playing along with us at Paper bakery!! Thanks so much Janet! The sketch was so perfect! Can't wait for the next Challenge! It was so much fun putting this together, and the look on my kid's face when I showed him it was just priceless. He has been sitting flipping through it, making plans for how to accomplish his goals. I love that I can use my hobby to nurture his adventurous spirit and help him achieve something. Thank you! I had so much fun working with all the embellishments I bought at your booth. I didn't buy nearly enough the FOUR times I stopped in. Thankfully I'll be getting your adorable products shipped right to my door once a month now! I may or may not have purchased ample extras this month too..
Holly this is soooo great! I LOVE that you used the sketch for your album cover! I am totally loving all the embellishments too! I love this idea of creating an album with your son too! I have 4 boys and I just started a cover of a mini album with the same kind of idea! I can't wait to see more of your album! I hope you use our future sketches for the inside!! Thanks so much for playing along with us @Paper Bakery!! Aren't boys so much fun! I need to start on a second one of these for my other son. He's 4 and he already has some pretty fun ambitions! I will for sure keep an eye out for more sketches! I have been in a bit of a creative rut lately, and it was just the thing I needed to get me going again. Boys are great! I'm glad the sketch helped you out of your crafty slump! Thanks Tegan! The colors are some of my favorites to work with, so happy and fresh! And I have such a crush on Freckled Fawn's embellishments, I'd buy one of everything if I had the money! I will for sure be watching for more sketches to play along, it was a lot of fun to take something and put my own spin on it! So inspiring! This is adorable. Thanks for playing with us at Paper Bakery.